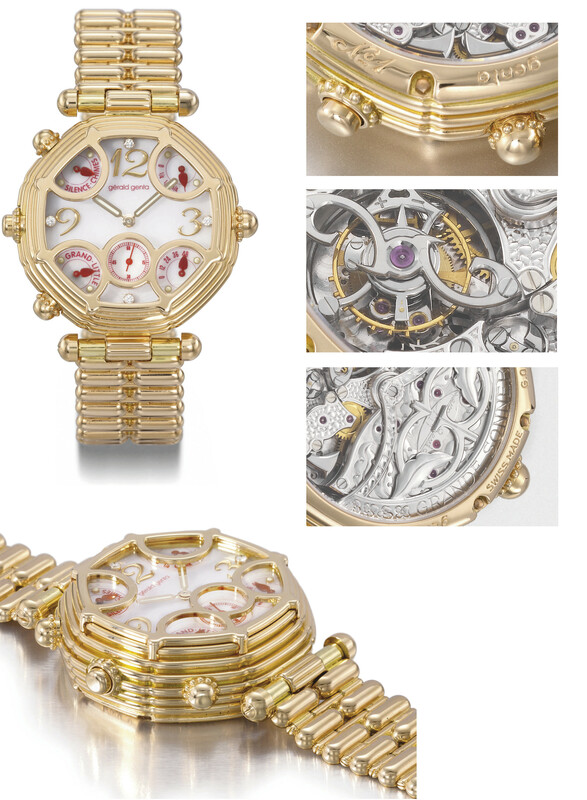 Amongst the world's most complicated wristwatches and an epitome of Gérald Genta's ingeniosity and artistic flair, reference G0027 was made in 1994 in three examples only: the present watch in pink gold case with the additional feature of the original pink gold bracelet, a second model cased in white gold and with leather bracelet (sold at Christie's Hong Kong on 30 November 2005, lot 2742) and the third in platinum. Its calibre 31000 movement is one of the most astonishing watchmaking creations of our time. A great creator of complicated watches, Gérald Genta was able to miniaturize the highly complex mechanism to fit into the comparatively small dimensions of a wristwatch while still performing acoustically. The over 1000 parts of the movements are all hand-mounted within a diameter of only 30 mm. and a thickness of 8.4 mm. Every component is hand-engraved with motifs inspired by nature. Particularly noteworthy is the addition of a self-winding mechanism, rendering the present timepiece even today part of the exceedingly small series of automatic "grande sonnerie" watches ever made. It does not only allow the owner to choose between the grande, petite or silent strike modes, the striking sound is in addition the particularly appealing Westminster carillon or Big Ben melody, stroke by four hammers onto four gongs. A further addition to its complexity is the one minute tourbillon, demonstration of a watchmaker's virtuosity and highly sought-after feature in today's market.